What do realtors expect from Budget 2019-20? From rationalisation of taxes to incentivising rental housing policy, developers have pinned high hopes on the upcoming Interim Budget 2019-20. The focus continues to be the revival of the industry in a format that is beneficial and fair towards all the stakeholders. With the Central government due to table the Interim Budget 2019-20 on February 1, ahead of the Lok Sabha elections, the odds are high that it will be a consumer-oriented budget that effectively addresses the prevailing challenges in the real estate sector. Taking note of the tremendous slowdown that the sector has faced in the last couple of years, developers have pinned high hopes on the upcoming Budget 2019, and expect a conducive work environment that revives their business across segments. From the long-standing demand for industry status, rationalisation of taxes, single-window clearance, incentivising of the rental housing sector to additional boost to the infrastructure sector, and ease of business for start-ups, builders anticipate Budget 2019 to be a pace-setter for Indian real estate. Presently, the high credit lending rates are the biggest concern for developers. The high cost of fund acquisition coupled with Escrow account compliance under the Real Estate (Regulation and Development) Act, 2016 (RERA) has created a financial crisis like situation for developers and has severely impeded project deliveries and supply of low-cost housing. However, if the real estate sector is granted an industry status in the upcoming Budget, it will not only help developers to secure low-cost funding but also pass on the benefits to the end consumers. Overall, it will be a win-win situation for both. Reduction in the Goods and Services Tax (GST) on under-construction projects from 12 percent to five percent is another key expectation from the impending Budget 2019. “Presently, a 12 percent GST rate along with the extended project deadlines to dodge RERA penalties has escalated not only the construction cost but also the property prices, which has severely affected the sales volume. Hence, a tax reduction is essential to augment the building-buying scenario in the country. Moreover, realtors also expect an increase in interest and the principal limit for tax exemption of home loans. 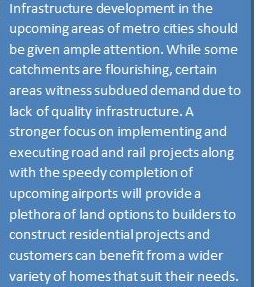 As the home prices have increased substantially, the interest and principal components have also surged and should be incentivised accordingly,” shares Sachin Bhandari, CEO, VTP Realty. While on one side, the Government’s prime focus is protecting homebuyers’ interest and affirming time-bound project deliveries under RERA, on the other, single window clearance is still biting the dust. The paradoxical situation has been troubling developers who are eager to deliver their projects on time, however, face the brunt of multiple project approvals since it increases the development cycle by one to two years. To accomplish ‘Housing for all by 2022’, it is imperative for the Government to incentivise the rental housing schemes. Indisputably, a roof over head is the basic but the most unaffordable need of the urban poor. Thus, it is crucial to offer some relaxations or compensations to rope in private players and fast-track the rental housing projects. Currently, taking note of the lurking ambiguity on the rules and regulations of the National Urban Rental Housing Policy and unattractive offers, private players are apprehensive of the joining the bandwagon. Lack of adequate early-stage funding, regulatory hurdles, higher taxation structure, and ease of doing business remain the biggest challenges for budding entrepreneurs. As per the start-up research platform Tracxn Labs, only 2,654 new start-ups were launched in 2017, vis-à-vis 12,267 start-ups in 2015 and 7,837 in 2016. Seeing the decelerating trend of the Indian start-up industry, the real estate industry stalwarts are looking forward to a conducive business environment, new regulatory policies, and concessionary tax structure for Start-up India Initiative in this budgetary session. 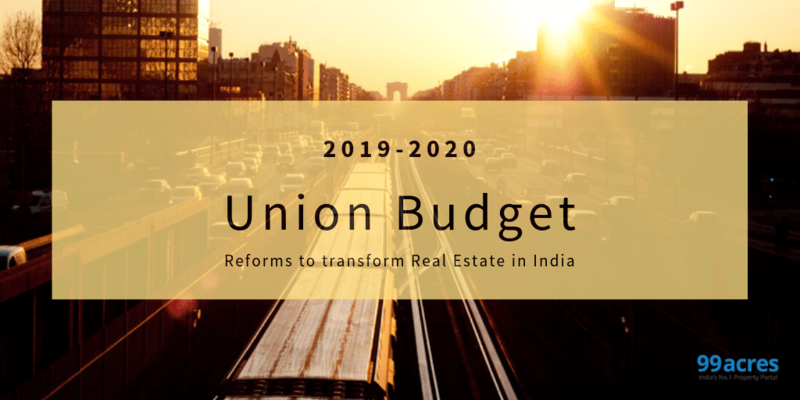 Holistically, with the Union Budget 2019-20 being the last for this term of the Centre, developers expect the government to rise to the occasion and address the challenges that the real estate industry faces. But, to what extent will the Budget 2019-20 go on to meet the long-pending concerns of the developer fraternity remains to be seen.